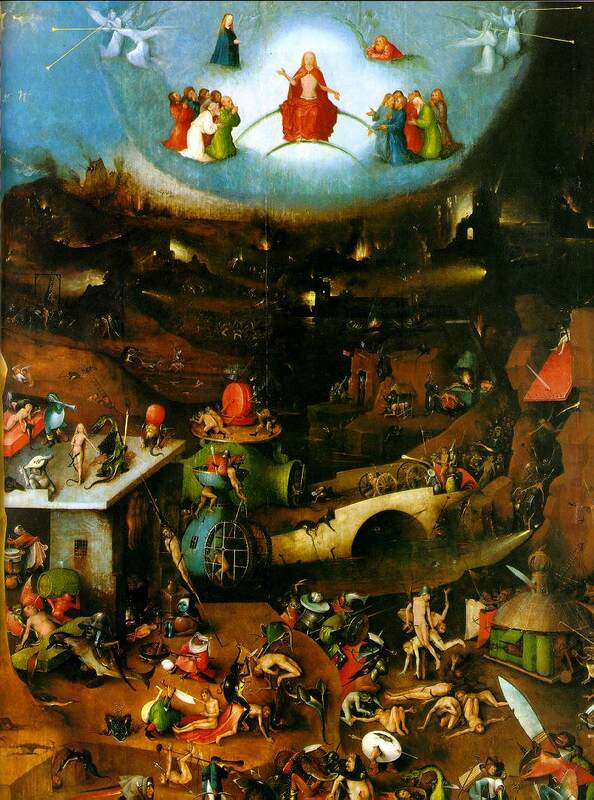 Flemish painter Hieronymus Bosch (c1450-1516) shows great imagination in his triptych altarpiece "The Last Judgment" (c1510-15, Academy, Vienna). You can also view a larger picture and details of this painting. Now John's vision begins to reach its consummation with the victory of Christ over his enemies. As you study these two chapters, look for how God might speak to you through them. 19:1-5 The multitude's joy springs from justice, not mere gloating over the punishment of the enemy for the sake of spite. 19:6 "A great multitude" comprises all God's servants (19:5), the completed, raptured church. These seem to be the same ones seen in the vision of Revelation 7:9-17 in white robes who "have come out of the great tribulation." Betrothal. More binding than our "engagement." The groom and bride are legally husband and wife and, as such, are under obligations of faithfulness. An interval separates the betrothal from the actual wedding ceremony. The groom and his company proceeds to the bride's house to receive her. 19:8 "The fine linen is the righteous deeds of the saints." Contrast the bride's pure attire with the harlot's gaudy purple and scarlet (17:4). The phrase "was given her" reveals that the robes were given to the saints, not provided by them. The white robes of 7:9, 14 were a result of washing "in the blood of the Lamb." But, seeing that righteousness is entirely by grace, not works, we are "created in Christ Jesus for good works" (Ephesians 2:8-10), the fruit of the Spirit-filled life. 19:9 "The marriage supper of the Lamb" is the fulfillment of the promises of Luke 12:37; 13:28; 14:15-24; 22:30; Matthew 8:11; 26:29. Q1. (19:7-9) These verses draw together two themes from Scripture -- (1) God's people as his betrothed Bride and (2) the feast of all God's people in heaven. When you meditate on these themes, how are you both admonished and encouraged? 19:10 "The testimony of Jesus is the spirit of prophecy" (John 5:39; Luke 24:27; 1 Corinthians 12:3). This oft-quoted sentence is a bit ambiguous in Greek and its exact meaning is disputed by scholars. The clause "of Jesus" could mean the "testimony which Jesus gives or inspires" (subjective genitive) or could refer to "testimony concerning Jesus" (objective genitive). Likewise, the second clause "the spirit of prophecy" could mean "Spirit-inspired prophecy" (subjective genitive) or perhaps "the principle that dominates prophecy" (objective genitive). However, in light of the fact that "the Spirit of prophecy" was a traditional Jewish name for the Spirit of God, it is likely that this phrase means, "The testimony borne by Jesus is the concern or burden of the Spirit who inspires prophecy" (Beasley-Murray 276), very similar to John's teaching on the Paraclete in John 14-16, especially John 16:12-15. 19:11 "White horse." White is a symbol of victory. Note in 6:2 the white horse and rider wearing a crown, "Conquering and to conquer." There the rider didn't seem to represent the Messiah. Here it surely does. "Faithful and True" (Revelation 1:5; 3:14; 21:5; 22:6). "In righteousness he judges and makes war." (2 Thessalonians 1:7-10; 2:8; Psalm 96:13; Acts 17:31; Hebrews 9:27-28). The Jews expected a military, conquering Messiah. His second advent will fulfill those prophecies they had pointed to, such as Psalm 2:6-10 and Zechariah 14. 19:12 "Eyes like a flame of fire" (Revelation 1:14; 2:18). "Many crowns." He has many diadems or crowns since he is "King of kings" (19:16), in contrast to Satan's usurpation of power (12:3; 13:1). The hymn "Crown Him With Many Crowns" takes its title from this verse. 19:13 "A robe dipped in blood." Not his own blood, but as Isaiah 63:1-6, the blood of the slain foes (19:15b). 19:15 References are to Isaiah 11:4, 63:3; Psalm 2:9; 2 Thessalonians 2:8. See also Revelation 2:27; 14:19-20. 19:16 His victory over the kings of the earth (verse 19) demonstrates his title: "King of kings and Lord of lords" (Ezra 7:12; Ezekiel 26:7; Daniel 2:37; Philippians 2:9-11; Revelation 17:14). This title is applied both to the God the Father and to the Son (1 Timothy 6:15). Q2. (19:16) What are the implications of Christ's title: "King of kings and Lord of lords" for your life? For the everyday world that surrounds you? 19:17 "The great supper of God." This gruesome scene is viewed in Ezekiel 39:17-20 where it is called a "sacrificial feast." What a contrast to the "marriage supper of the Lamb" (verse 9)! This vision emphasizes the greatness and universality of the coming slaughter. 19:18 "The beast and the kings ... gathered to make war." This is the Battle of Armageddon (16:16). See my notes and references at 16:14. 19:20 "The beast and the false prophet" are, respectively, the "beast from the sea" (13:1-8) -- the Antichrist -- and "the beast from the earth" (13:11-18), that is, religious power in support of the civil power of the Antichrist. "The lake of fire" later provides the final end of the devil (20:10) and those who were not followers of the Lamb (20:14-15; 21:8; Matthew 5:22; 25:41). Chapter 20 is one of the most debated chapters in Revelation. The issue is the place of the "millennium" (which means "1,000 years") in the scheme of End Times events. There are four main schools of thought. These are discussed in detail by major exponents of each view in the excellent book The Meaning of the Millennium: Four Views, edited by Robert G. Clouse (InterVarsity Press, 1977, ISBN 0877847940, paperback, 223 pages). If you're trying to get a handle on this subject, I strongly recommend for you to study this book to get a fairly-presented case for, and implications of, each view. Of these four views, only the second teaches the pre-tribulation rapture. Be sure to print out the Chronologies of the Millennium and Christ's Return chart (www.jesuswalk.com/revelation/4millennium.pdf) so you can visualize these four views. Historic pre-millennialism teaches that the order of events is: tribulation, rapture, millennium, new heavens and earth. Dispensationalism pre-millennialism teaches this order: "secret rapture" of the believers, tribulation, Christ's return, millennium, new heavens and new earth. Amillennialism is really a misnomer, for amillennialists believe that the millennium (seen as Christ's heavenly rule) coincides with the Gospel age and tribulation. Christ's return and rapture are followed immediately by the new heavens and new earth. Post-millennialism sees the conflict between good and evil on earth as gradually giving way to the fullness of the kingdom and victory of the church which is the millennium, followed by Christ's coming in judgment and the new heavens and new earth. Few adherents of post-millennialism remain because of disillusionment following the World Wars of the twentieth century. Dispensationalism's pre-tribulation rapture is the newest of the four theories. It is reputed to have first been prophesied by a woman in the Irvingite Movement in mid-nineteenth century England and spread to America through the writing and lectures of J.N. Darby (Plymouth Brethren), and later, C.I. Scofield, and the Bible College movement, detailed in The Incredible Cover-Up: Exposing the Origins of Rapture Theories, by Dave MacPherson (Omega Publications, 1983; ISBN 0931608066). Of the various theories, I see the most Scriptural support for Historic Pre-Millennialism (post- or mid-trib variety). 20:1 "Key of the bottomless pit." See my notes on 9:2. 20:2 "He seized the dragon ... and bound him for a thousand years" (2 Peter 2:4; Jude 6). Amillennialists see this section as a recapitulation of the history of the church from another viewpoint. That the binding of Satan is figurative for the restraint of Satan's power suggested in Matthew 12:29; Luke 10:18; Revelation 12:9; and 2 Thessalonians 2:7. They take the thousand years as figurative for the period from Christ's ascension to the appearance of the Antichrist. They see the release of Satan (20:3, 7) as equivalent to the revelation of the Antichrist. They identify the Battle of Armageddon (16:16; 17:13-14; 19:11-21) with the Battle of Gog and Magog (20:8-9). The flaw with this view, in my opinion, is the necessity of spiritualizing the "first resurrection" (19:4-6). The judgment of Babylon (chapters 17-18) must precede the reign of the martyrs (19:4) who were seen previously (6:9-11) as awaiting vengeance and the completion of their number. In addition, a comparison of 19:20 and 20:10 seems to prohibit any idea of recapitulation here. 20:4 "Thrones ... those to whom judgment was committed" (1 Corinthians 6:2; 2 Timothy 2:12; Daniel 7:9; Matthew 19:28; Daniel 7:22). This may be a reference to the whole church's reign with Christ. "Those who had been beheaded." I believe all Christians will share in the reign, but the spotlight is on the now-vindicated martyrs (see 6:9-11). "Come to life," a reference to the resurrection of believers (1 Thessalonians 4:14-17; 1 Corinthians 15:51-52). A similar way of speaking of resurrection is found in 11:11 where the two witnesses (= the church, see notes on 11:1) come alive again. "A thousand years." This may be literal, but is probably figurative of a long time. The number "thousand" was often used generically as a large number, something like how we use "a million" (Psalm 50:10 and 2 Peter 3:8). "The rest of the dead" probably refers to the unbelievers. This time separation between the resurrection of the just and the unjust was not made explicit in earlier Scriptures (Daniel 12:2; John 5:28-29; Acts 24:15). These unbelievers are raised at the end of the millennium to be judged (20:11-13). You may wonder: Over whom do the martyrs and saints rule? This question is not answered in the text. The most likely assumption from the text is that the survivors of the tribulation are the subjects. Whether saved or unsaved we are not told. However, the children of these original millennialists, may not follow the religion of their parents. A choice will be theirs. Even without Satan's active deception (20:3), the unregenerate heart is rebellious. Many will follow Satan when he is again loosed (20:7). Some Dispensationalists see this as a time when the promises to the literal Jews (the 144,000 of the tribulation, as they see it) are now literally fulfilled, such as the building of Ezekiel's temple (Ezekiel 40-48). However, it is very difficult to decide which Old Testament prophecies speak of the millennium (if any) and which speak of the new heavens and the new earth. We know from the Epistle to the Hebrews that the Jewish sacrificial system is obsolete after Christ's complete sacrifice (Hebrews 8:13; 9:12; 10:18), nor do we see any indication that a literal temple or tabernacle will be rebuilt under Messiah's reign (Hebrews 8:1-2; 9:11). A demonstration of the corruption of the human heart despite the best environment, that is, a vindication of God's righteous judgment which cannot be put off by the excuse: "It isn't fair." 20:8 The final battle between the nations will involve Gog and Magog against the "camp of the saints" at Jerusalem (Ezekiel 38-39). There are a number of similarities with the battle of Armageddon. 20:10 "Tormented day and night forever." This not annihilation, as some teach, but eternal, conscious torment in the lake of fire. See my notes on 14:10-11. 20:11 "A great white throne." See Revelation 4 and 5. All mankind is summoned before God. This is the time of the second resurrection, presumably of the unjust. It may also be the time of judgment of Christians, described also as "the judgment seat of God" (Romans 14:10-12) and "the judgment seat of Christ" (2 Corinthians 5:10). However, Christians are not in danger of damnation like the unbelievers (John 5:24; 1 Corinthians 3:12-15), but are vindicated in the process and their names are found in the Lamb's book of life (20:12). 20:12 "Books were opened" (Daniel 7:10). This is a record of the deeds of each person. A reading will show the pure justice of God's verdict. "The book of life." A list of those "recorded for life in Jerusalem" (Isaiah 4:3; Daniel 12:1). Alford (4:735) writes: "Those books and the book of life bore independent witness to the fact of men being or not being among the saved -- the one by inference from the works recorded, the other by inscription or non-inscription of the name in the list." Q3. (20:11-12) Why is this awesome scene of judgment so frightening? Why do people seem to resist the idea of a final judgment? Q4. (20:12-15) Here is a serious question for each of us -- not one we should respond to with pat answers. What assurance do you have that your name is written in the Book of Life? If you need to know how to receive Christ as your Savior, please consider the simple Four Spiritual Laws (www.greatcom.org/laws/english/flash/). Feel free to contact me. Perhaps I can help guide you towards Christ. 20:14 "Death and Hades were thrown into the lake of fire." This is a symbolic way of saying: "Death shall be no more (21:4). 20:15 "Not found written in the book." A person is either a follower of Christ or not, there is no middle ground. A great many follow the broad road (Matthew 7:13), are deceived by the Whore of Babylon (Revelation 17-18) and the glitter of riches (1 John 2:15-17; Matthew 13:22), and do not seek life from Jesus. Their displacement of Christ's lordship in favor of money (Matthew 6:24) is rebellion. The result of that rejection is the lake of fire. The chapters we have just studied are controversial. But let's not get hung up on the things we can't be sure of -- especially the exact chronology of the rapture and the millennium. What we can be sure of are the certainty of Christ's victory over the world and Satan, of judgment, of reward and of punishment. These things are clear -- and awesome. Lord, these are fearful chapters. Our world would tell us that judgment will never come, that we can flaunt God's laws and get away with it. But as I read of this terrible judgment, I am aware of my own sins. I need your forgiveness, Lord, and believe that you have forgiven me through your grace. Thank you for writing my name in the Lamb's Book of Life. I am not worthy, but you have made me worthy. In Jesus' name, I thank you. Amen.